This is small, very visible area, directly south of the McArthur Causeway currently comprised of 4 recently completed buildings across Biscayne Boulevard from Bicentennial Park and the American Airlines Arena. The homes for sale in Park West are stunning and offer some of the finest unobstructed views of the bay, city, and ocean. Park West homes for sale is thought by some to have the greatest long term investment potential defining Miami's version of NY's Central Park. The future vision of Park West covers the area west of Biscayne Boulevard, Bicentennial Park, and Watson Island is well underway. This exciting city is giving rise to Miami World Center located on 30 acres in Park West behind One Thousand Museum, Ten Museum, 900 Biscayne Bay, Marina Blue, and Marquis. A dynamic urban core, Miami World Center will be home to Paramount, a luxury condominum, the new mass transit transportation system, entertainment venues, numerous retail, dining, and offices. The Science Museum and Planetarium is about to open its doors at Bicentennial Park adjacent to the Perez Art Museum along the bay. A city within a city, MIami World Center will be one of the largest private, master-planned urban environments in the world. A future epi-center mixing commercial, retail, residential, and entertainment, the Miami World Center, together with the future plans for Watson Island, the luxurious new One Thousand Museum Condominum, and the museums at Bicentennial Park, are anticipated to transform the Park West district of Downtown Miami. 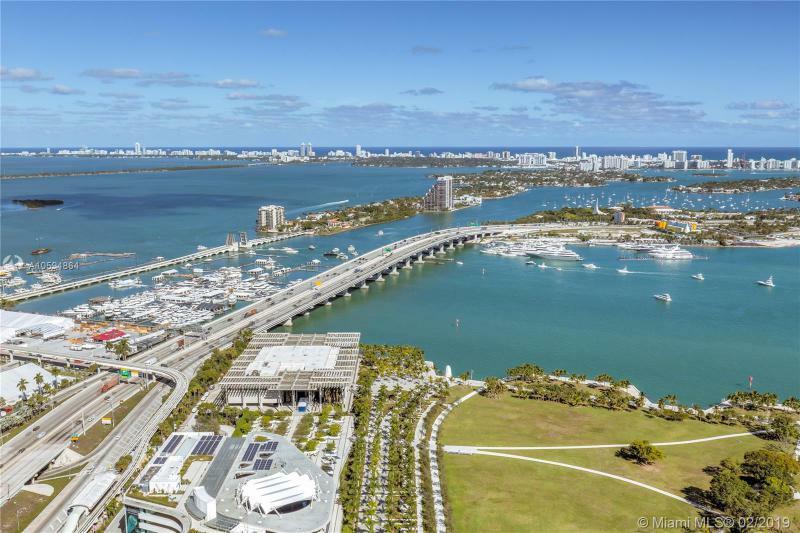 The best unobstructed views in Downtown Miami, overlooking Biscayne Bay, Port of Miami, AAA Arena, Miami Beach skyline, Frost Museum, and more. The 06 line features high ceilings with plenty of natural light, an over sized floor-plan, full Bathrooms on each floor, walk-in closets, floor-to-ceiling windows, and a expansive views from the glass shower enclosure. This unit may be used as a convertible 2/2 and potentially built-out on the second floor for additional square footage. Enjoy the vast amenities including two pools, gym, sauna, as well as the residential perks from Melia hotel . Almost new unit, it has never been lived full time; it is a vacation home used by Owner only a few days per year. FABULOUS UNIT FOR SALE, UNFURNISHED, MINT CONDITION, BEST BAY VIEWS IN TOWN; OPEN FLOOR PLAN, COMFORTABLE MASTER SUITE, SPACIOUS DEN THAT CAN BE USED AS SECOND BEDROOM OR OFFICE,TWO FULL BATHROOMS, CUSTOM MADE CLOSETS, PORCELAIN FLOORS; KITCHEN AREA HARMONIOUSLY MIXES WITH LIVING AREA TO END AT A GORGEOUS TERRACE OVERLOOKING BISCAYNE BAY. ONE EXTRA LARGE STORAGE CAGE # 902-J & ONE COVERED PARKING SPACE #11017 ARE INCLUDED IN THE SALE * Unit is currently rented until the end of July 2019. Amazing spacious one bedroom with two full bathrooms 900 Biscayne, the most prestigious building at the edge of Biscayne Bay. Stunning views in all directions. Unit features marble floors throughout and top of the line finishes. Building offers state of the art amenities such as gym, spa, sauna, Jacuzzi, business rooms, short distance to museums, performing arts, American Airlines Arena and much more. JUST REDUCED! This chic & sophisticated beauty is the epitome of Miami living. A private elevator will bring you to a large private foyer where you'll step into spectacular views, wraparound balconies, & arguably the most beautiful unit in the bldg. There was not a detail spared in this 1694 sq ft designer decorated, fully furnished gem. Kitchen is an epicurean delight. You'll enjoy motorized blinds for your floor to ceiling windows where you'll be awed by the most amazing sunrises & sunsets. Make this masterpiece of contemporary living & entertainment your home. Modern amenities include a brand-new renovated pool, state of the art gym facilities, child care center, spa & entertainment rooms. Includes 2 assigned, side by side parking spots & large storage unit w/ AC on low floor. Must See! 2BD/2.5BA PLUS DEN 900 BISCAYNE DIRECT OCEAN AND BAY VIEWS: Excellent address! Offering wood floors throughout, gourmet kitchen, magnificent master suite with luxurious bath. Grand lobby, first-class amenities include an olympic-size heated pool, state of the art spa, private fitness center, tennis, marina, security, valet parking and concierge service. Finished to perfection and priced to sell. Easy to show - see broker remarks. Modern living at its best in the cultural center of the city! This 1,802 sq.ft. 2/2.5 sky loft w/ 20' walls of glass offers stunning views of Museum Park, Biscayne Bay, South Beach and the Miami skyline. This loft is finished to perfection with porcelain flooring throughout, fully S/S kitchen w/ Miele, Sub Zero and Bosch appliances. This home includes such upgrades as motorized solar shades, full-sized Miele washer & dryer and an amazing kitchen island. Included with this unit is air-conditioned storage and two parking spaces. TMP is a full-service building with 24-hour concierge, the Clinique La Prairie Spa, full gym and cardio room, five swimming pools, security and all of the amenities of a true luxury high-rise in Miami. JUST REDUCED FOR A QUICK SALE!!! BEAUTIFUL AND SPACIOUS 2 BED 2.5 BATH W/ SPECTACULAR DIRECT BAY & OCEAN VIEW, EUROPEAN KITCHEN WITH TOP OF THE LINE APPLIANCES, LARGE WALK IN CLOSETS, LARGE TERRANCE, PRIVATE ELEVATOR, THIS IS AN EXQUISTE LUXURY BUILDING WITH PLENTY OF AMENITIES AND TOP OF LINE SERVICES, EXCELLENT LOCATION ACROSS THE STREET OF THE MUSEUMS. MUST SEE!!!!! Best Deal in the Building !!! !2 BEDROOM + DEN + 3 FULL BATHROOMS,ONE OF Miami Best VIEWS OF BISCAY BAY and OCEAN views ,PRIVATE ELEVATOR AND FOYER, PORCELAIN FLOORING, HUGE TERRACE. 10' HIGH CEILING, BUILT-IN CLOSETS HIGH-END KITCHEN, ITALIAN CABINETS, APPLIANCES BY SUB-ZERO. APARTMENT IN MINT CONDITION, LIKE NEW. STATE-OF-THE-ART AMENITIES: 2 RESORT-STYLE POOLS, JACUZZI, FITNESS CENTER, BBQ AREA, MOVIE THEATER, RESIDENCES LOUNGE, SPA, KIDS ROOM, VALET PARKING AND CONCIERGE. 24 SECURITY. RIGHT IN FRONT OF AAA ARENA, BAYSIDE MARKETPLACE, PHILLIP & PATRICIA FROST SCIENCE MUSEUM AND PEREZ ART MUSEUM. LETS MAKE A DEAL!! One Of a kind Custom designed 2/2 residence at Ten Museum Park by renowned Architect, Chad Oppenheim. Enjoy endless Southwest views from this 33rd floor corner residence through 10' floor-to-ceiling walls of glass. Custom kitchen island with natural stone, Italian tile backsplash, custom bar, European doors, hardware and trim throughout, solid white marble floors, and many more refined touches. This boutique tower features a state-of-the-arts fitness center, spin & yoga studio, private full-service spa, 5 pools 24-hour valet, concierge and more. Located in the heart of Miami's Arts & Entertainment District, across from the Perez Art Museum, Frost Science Museum and the soon-to-be-complete Miami World Center. Happy to be home so soon? You will be in this breathtaking abode, high above, and amidst community and world festivals, celebrations, events and occurrences, with stunning views all around!Elegant, spacious Living/Dining room with splendid views.Capacious Master Suite again with abundant views and with larger than ample, accessible closet space, elegant distribution of space among convenient options!Guest Chamber has its own spacious bath and splendid views!Kitchen, sleek in design, is part of the Living and Dining Room decor and accentuates the modish, modernity! SOLD FURNISHED Luxurious finishes on this hard to find 06 line at sought after 900 Biscayne. The 06 line is the premier line in the building featuring 3 full bedrooms and a large den and 4 bathrooms. 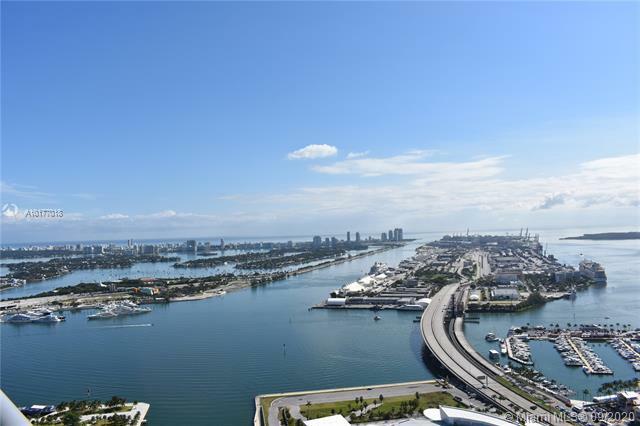 Jaw dropping direct water views to Biscayne Bay and Miami Beach in this well located building across the street from from Perez Art Museum, Planetarium, Performing Arts Center, American Airline Arena and easy access to the highways. Easy to show. Unit occupied. 24 hours notice. Enjoy breathtaking sunrise and sunset views from every room in this 3 bed, 2.5 bath, SE corner flow-through unit at MARQUIS Residences. Expansive 2,106 SQ.FT of interior living. Enjoy private elevator access, white glass floors, open kitchen w/Viking appliances and floor-to-ceiling glass throughout. This home also features automated shades and plenty of storage and a full sized laundry room. Live in the cultural hub of the city across from the P.A.M.M, Frost Museum of Science and Museum Park. Marquis Residences is a full service luxury tower with 24-hour front desk/concierge, 24-hour security, 2 pools, gym, new basketball court and more. Residents enjoy all of the luxurious Hotel offerings of The Gabriel Miami, Curio Collection by Hilton. 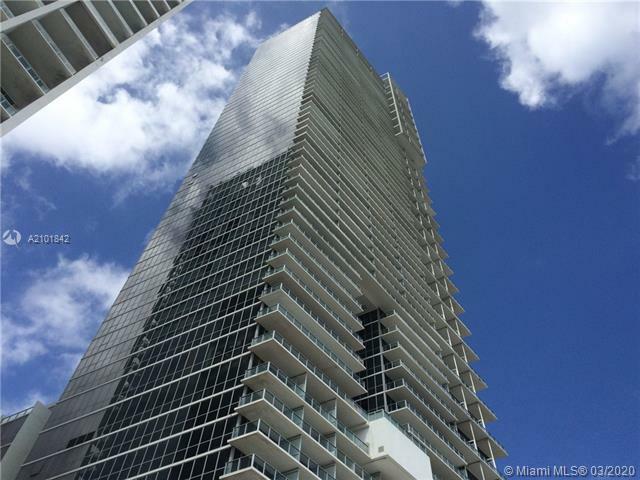 Live in luxury in the heart of Miamis cultural center at the desirable Marquis Residences. This 3 bed/2.5 bath flow thru residence located in the Southeast corner of the building features 2,106 sq ft of living space. Enter this dazzling unit through private elevator entrance to open living area featuring floor to ceiling windows that showcase picturesque Port and Downtown views. Top of the line kitchen features sleek cabinetry and Viking appliances. Large master suite features built out walk-in closet, spa like bath with dual vanity and glass enclosed shower. Savor direct water views from your spacious terrace. Marquis Residences features luxurious amenities by ME Hotel and Spa located in close proximity to the PAMM, Frost Science Museum, American Airlines Arena and beautiful Museum Park. Beautiful corner unit 3 Bed 3 bath with 20 foot ceilings. White porcelain floors throughout with glass stair railing. Amazing views of Miami Beach and government cut. Electric somfy blinds. Live in Downtown Miami's premier, full service, luxury building across the street from Museum Park and the American Airlines Arena. This bay loft has porcelain and marble flooring throughout, shared living quarters on the first floor and the bedroom suites on the second; dramatic 18' ceiling height provides for an abundance of natural light throughout and views of Biscayne Bay, Miami Beach to the Atlantic Ocean. One Assigned Parking Space, 24 hour valet for additional cars. SPECTACULAR PANORAMIC CITY, BAY & OCEAN VIEWS FROM 4 BEDROOM + 4.5 BATH FURNISHED PENTHOUSE AT 900 BISCAYNE! Enormous open living space with 10' ceilings; walls lined in Teak Wood; bathrooms wrapped in white Carrara Marble, electric window shades, marble & whitewashed wood flooring throughout. Private elevator entry, wraparound balconies to enjoy sunrises over the Atlantic Ocean and sunsets over the city of Miami. 2 pools, spa, gym, resident's lounge, kid's playroom, theater, concierge, valet, security. The Penthouse at Ten Museum Park by Oppenheim Architecture + Design, Downtown Miamis most Monumental Penthouse Villa. This 3-level home features 24-ft ceilings, 5 bedrooms, 5.5 bathrooms, chef's kitchen, 2 media rooms and a private rooftop plunge pool. The entire South East corner of Ten Museum Parks Tower with views of Biscayne Bay, South Beach and the Atlantic Ocean. This is the ultimate entertainment palace in the sky located in Downtown Miamis Arts & Entertainment District in close proximity the American Airlines Arena, Adrienne Arsht Center, Perez Art Museum and Frost Museum of Science. Enjoy resort-style amenities with a 24-hour concierge, valet parking, fitness center and spa. Distinctly designed and finished, offered turn-key fully with pieces by Axel & Vervoordt. Elegant 45th floor contemporary loft at the Marquis Residences. Prime location within minutes of the Perez Art Museum, Arsht Center for the Performing Arts, American Airlines Arena, South Beach & so much more. This luxury building features 2 pools on the 14th floor, spa, business center, juice bar, restaurant, court basketball, concierge, & much more. 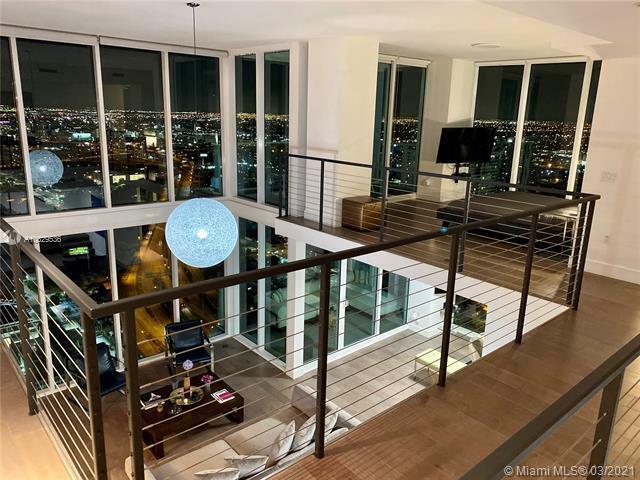 As you walk thru the front door youll appreciate ever changing 180 degree views of the bay, Port of Miami, downtown & South Beach thru the 20 ft. high windows. Downstairs youll find a cozy den, full bathroom & social areas. Relax on the balcony with a glass of wine. Full sized washer & dryer in the enclosed utility room & extra storage space under the stairs. Upstairs the master suite & the glassed-in shower face the outstanding views. Extraordinary two story home in the sky with 20 ft. glass commanding the best views Miami has to offer. The home features sleek Italian porcelain flooring, walnut staircase, custom California closets and modern kitchen with Viking appliances and quartz countertops. Master suite on 2nd floor features an oversized walk-in closet, bay view rain shower and a flor to ceiling seamless glass wall providing privacy from the 20 ft drop to the living room. High 51st floor with unique double width balcony! 2 story residence with panoramic views overlooking Biscayne Bay. Breathtaking vistas of the cruise ships coming and going, Miami Skyline and views over the bay to the ocean, seemingly stretching beyond the horizon.This 1675 sq. ft. residence features an oversized master suite plus den and 2 spacious full baths. custom designed open kitchen that open to a large living room. Other features include, deep spacious balcony, oversized laundry room, Floor-to-ceiling windows, a den that can be easily converted to be used as a second bedroom. AVAILABLE NOW!BEAUTIFUL UNIT AT 900 BISCAYNE - Clean, Freshly Painted and Bright Residence with Balcony facing Boulevard Bay with 1 Large Bedroom and Den and 2 Full Baths with Marble Floors, Stainless Steel appliances. Unit comes with 1 Assigned Parking. Residence its located in the 3rd Floor with easy access from the Lobby Level. Area is close to Beautiful Bayfront Park, Stadiums, Museums and restaurants. Small Pet is Ok with some restrictions. Rent a beautiful 2 bed / 2.5 bath + den townhouse in a centrally located building: 10 minutes from Brickell, South Beach, Midtown, Design District, Wynwood and Miami International Airport. Parking space is located on the same floor as the apartment, space number 5027. Building offers 24hr security, 2 valets, 2 lobby's, 24hr concierge. Furnished, luxurious 2bed 3 bath + 2 dens (open) with great water & city views, Italian cabinets and SS appliances. State of the art fitness center, spa, movie theater, 24 hr. Concierge, valet service, etc. The best views in miami! 1,557 Sq ft on 54th Floor with Spectacular upgrades, gym, concierge, 24hr security and valet. Amazing price for high unit in the most desirable line in the building. Views of Biscayne Bay, The Port of Miami, The Perez Art Museum, and much more. 5 star amenities and restaurants a true resort living with a spa! Will not last! SPECTACULAR FULLY FURNISHED 2 BEDS / 2.5 BATHS CONDO WITH BREATHTAKING BAY VIEWS, HIGH CEILINGS, CUSTOM BUILT OUT CLOSETS, WINDOW TREATMENTS THROUGHOUT AND TOP OF THE LINE APPLIANCES AT MARQUIS RESIDENCES. SPACIOUS MASTER BEDROOM WITH OVERSIZED GLASS ENCLOSED SHOWER, ONE ASSIGNED PARKING SPACE PLUS SECOND CAR COMPLEMENTARY THROUGH VALET, 24 HR DOORMAND, CONCIERGE, SECURITY, SPA, FITNESS CENTER, AND MORE!!! 6 Month and a half rent!! Fully furnished 2 BD/2.5BA. Unit in the exclusive Marquis Condo. Private elevator opens to private foyer. Spectacular Bay and City views from 2 bedroom. Floor-thru unit with 10' ceilings and floor to ceiling glass window walls. Blackout shades in bedrooms and living room. Top op the line kitchen with italian cabinets. 1 parking space + Valet. Amenities include Spa, Fitness, Sky Pool Deck, Restaurant. This is a full service building with amenities. Excellent location only minutes to the Airport and Miami Beach. LIVE AND ENJOY DOWNTOWN MIAMI'S MOST ELEVATED LIVING. RISING OVER BISCAYNE BAY AND DOWNTOWN MIAMI AT THE THRESHOLD OF MIAMI BEACH, MARQUIS RESIDENCES OFFERS AND IDEAL ADDRESS AND EXCLUSIVE LIFESTYLE; FROM BOLD ARCHITECTURE TO WELL CONSIDERED AMENITIES, TOTHE SPACIOUS LAYOUTS AND FLOOR-TO-CEILING VIEWS FROM THE RESIDENCES THEMSELVES. Gorgeous 2 bedroom 2.5 bath corner unit with floor to ceiling glass walls and stunning views of the bay, Miami Beach and the city! Private elevator lobby entry - Custom built walk-in closet, Italian porcelain flooring and stainless steel appliances. Enjoy these lux amenities: two heated pools, Full service Spa, fitness center, Yoga studio and so much more. All-suite boutique hotel by THE GABRIEL - Cultura restaurant/bar/lounge. 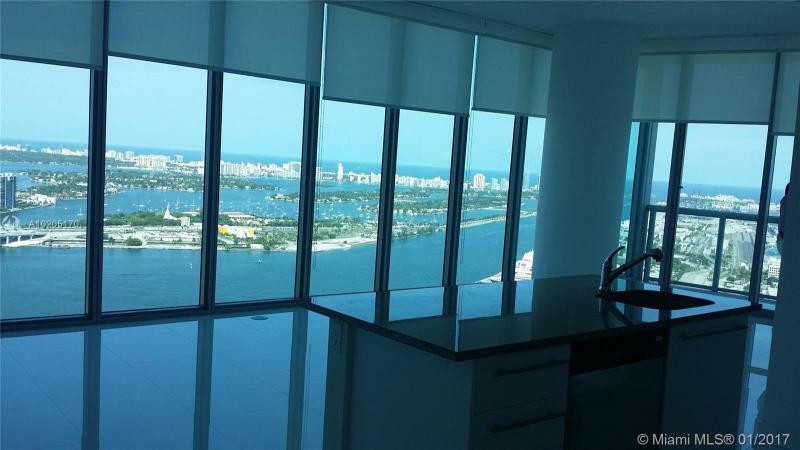 This 2 bedroom/2.5 Bath Condo with private elevator entry, has the most amazing views of Miami. Located just across from the PAMM & Frost Museums it is also just a 10 min drive to Miami Beach and walking distance from Brickell. Live a lux, exclusive life at Marquis Residences and enjoy top notch amenities. Stunning 2/2 filly furnished facing the direct bay views.. private elevator and on the 45th floor.. enjoy all the amenities the Marquis has to offer! Located in the heart of downtown miami this unit has it all! Marble floors, custom built outs, ventietian plaster, with custom cabinetry through out! Wont last! Contact me for an appt! Enjoy breathtaking views of bay & ocean from this beautifully furnished 2 bedroom (1 standard bedroom + Den converted into 2nd bedroom), floor to ceiling sliding glass doors open to a balcony overlooking Biscayne Bay & SoBe. The beautifully designed 10ft ceiling unit has spacious layout & designer furniture, double sink master bathroom with bathtub & glassed-enclosed shower, large custom-made closets & porcelain floors. The open kitchen includes Miele appliances, subzero fridge, a chef island & breakfast bar. High-end amenities include fitness center, spa, pool, jacuzzi, business center, club room, theater, library, pool table, valet, concierge, & 24h security. Water, internet, cable & included. Walking distance to the Entertainment district, parks, restaurants, shops & Metromover station. AVAILABLE FOR MINIMUM 3 MONTHS! BEAUTIFUL FULLY FURNISHED ONE BEDROOM APARTMENT PLUS DEN CONVERTED TO A 2 BEDROOM, 2 BATHS CONDO WITH TOP OF THE LINE STAINLESS STEEL APPLIANCES, WHITE GLASS TILE FLOORS, HIGH CEILINGS, WINDOW TREATMENTS, HUGE CUSTOM BUILT WALK IN CLOSET IN MASTER BEDROOM, TWO BALCONIES AND WASHER AND DRYER INSIDE UNIT. KING SIZE BED IN THE MASTER BEDROOM, QUEEN SIZE BED IN THE GUEST BEDROOM AND QUEEN SIZE SLEEPER SOFA IN LIVING ROOM. FULLY FURNISHED INCLUDING 55 INCH SMART 4K TV, BASIC CABLE AND HIGH SPEED INTERNET INCLUDED. AMENITIES INCLUDE TWO POOLS, GYM, CLUB ROOM, KIDS PLAY ROOM, MOVIE THEATER, SPA WITH STEAM ROOM, SAUNA, JACUZZI, CONCIERGE, VALET PARKING AND MORE. FOR SHOWINGS PLEASE CALL LISTING AGENT. Gorgeous 2/2 at 900 Biscayne with amazing views. Prestigious amenities, 24 full service, concierge, 24 hours valet parking, pool, spa, movie theater, kids playroom. Excellent location with array of cafes, restaurants, shops, and bars to choose from. Freshly painted, turnkey ready. Basic cable and water included. Assign parking, pet friendly quick turn around time for approval. What more can be said about this unit. This 50th floor 2 bed 2 bath unit is absolutely stunning. The water and city views are breath taking. This unit it a full open concept kitchen looks out over a large living room. The kitchen has an marble rainfall island, with imported Italian cabinets and marble floors throughout. The large master suite has a balcony that has insane water views. Large walk in closet with custom built in's. The master en-suite boats a gorgeous double vanity, both walk-in shower and sunken soaking tub. World class amenities in the building, two pools, spa, children's play room, massive business center, entertainment rooms and more. Call to set your appointment today to view this gorgeous unit. Most amazing view of Miami, Biscayne Bay and Miami Beach. Corner penthouse unit with spectacular sunrise and sunset views. Wrapped in 10 high floor to ceiling impact glass windows with electric shading. 2 large private elevator foyers, 3 bedrooms/4 full baths + half bath + maids/in laws quarters ensuite + office/family room den. Full of storage.Huge living room flow thru floor plan with unobscured Biscayne Bay views. All unit flooring in Marble, marble counter top, Italian cabinetry, top of the line Miele Sub-zero appliances. Huge master bedroom with separate sitting area, electric blackout shades and panoramic views. 2 walking closets with custom closets. Building with magnificent amenities, 2 pools, spa, state of the art gym, resident's lounge, kids playroom, theater, concierge, valet. For that one of a kind client that likes to live life at the top! Luxurious furnishings & finishes, Over 2,800 interior Sq.Ft. in Marble, Expansive top floor views (63rd) from every bedroom; Balconies in every room overlooking Biscayne Bay & the city skyline, perfect for sunsets & sunrises. Ultimate privacy; Private Elevator w/ imperial double door entrance & Feng Shui water fall to greet you. Brand new modern furniture/Art make it a home. Top of the Line Appliances. Luxury condo rental. Featuring three bedrooms all en-suite and a powder room, laundry room. Come off the elevator directly into your home with unobstructed views of the ocean along Biscayne Boulevard. Super close to the highway, entertainment, fine dining, hotels, (PAMM) Perez Art Museum, Museum of Art & Design and World Famous American airline arena just steps away. On site valet parking along self parking option makes it a breeze commuting to and from your home. From your private balcony you can see the sunset and the sunrise. You can rent furnished or unfurnished six month or one year term while enjoying this full service building which amenities include pool spa and gym. CONTEMPORARY 3 BEDROOM CORNER UNIT IN MARQUIS! Spacious & Bright unit wrapped in glass with Panoramic City, Bay & Ocean Views. Finished to perfection with White Glass floors, Electric Blinds & Private Elevator Foyer. Large Master Suite w Direct Views of the Bay & Ocean. Open European Kitchen to living areas with Zebrawood Cabinetry, Subzero + Miele Apps. Bayfront Pool, Fitness Center & Spa with 24 hr Concierge & Security. 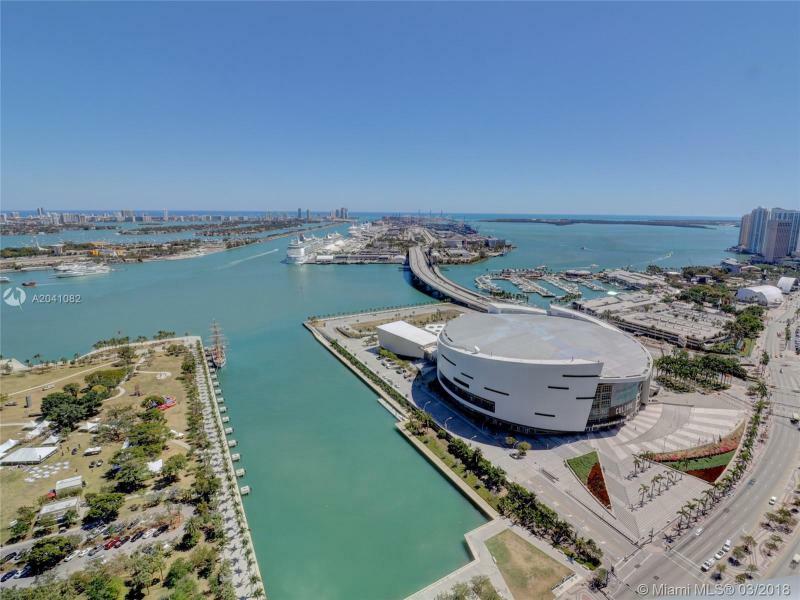 Just a few steps to the Waterfront Park, Perez Art Museum, Frost Science Museum, American Airlines Arena & the highly anticipated Miami World Center. 1 Assigned Parking + Valet. 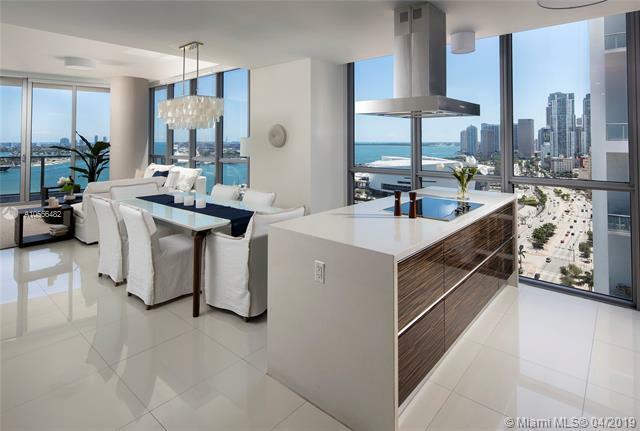 3BD + Den 4BA An unparalleled lifestyle at this 5-star building in the heart of Downtown Miami. This condo offers stunning views throughout - of bay and city. Unit is beautifully designed and spacious. Building offers all amenities, including a private theater, spa, gym, entertainment center, BBQ are, 2 pools, security, front desk attendant and much more. It is in walking distance from dining, entertainment, the arena, performing arts, museums, etc... Easy access to Miami Airport and Miami Beach, centrally located. Easy to show, call to schedule a showing appointment. 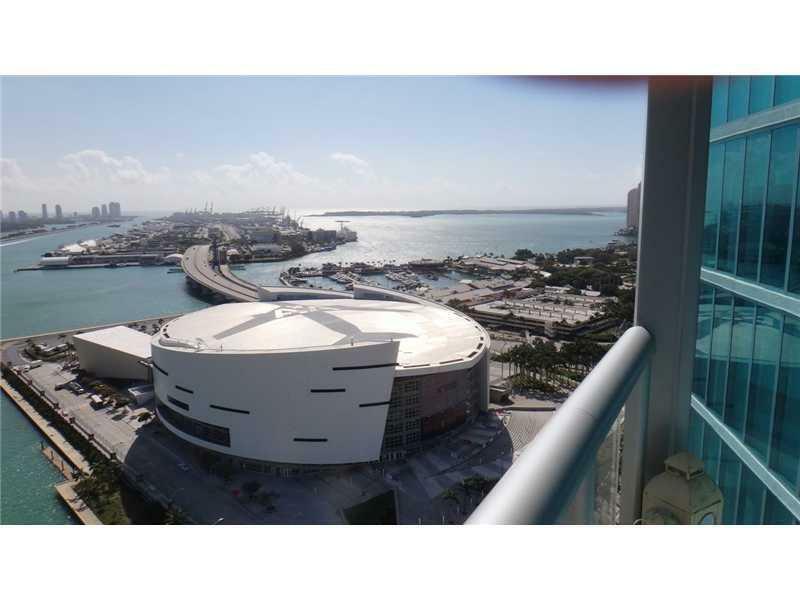 UNOBSTRUCTED NE BISCAYNE BAY & CITY VIEWS OVERLOOKING MUSEUM PARK, PAMM, FROST SCIENCE MUSEUM & AAA ARENA. HIGH FLOOR HUGE 3 bedroom plus Den, 4 full Bathrooms Corner Unit with 24 x 24 white porcelain flooring throughout the unit and terraces. Kitchen with Carrara Marble counter tops, Dark Wenge Italian cabinetry, Miele and SubZero Appliances. Private Elevator Entry Foyer plus separate service entrance. 10' high Ceilings. Amenities include 2 Pools overlooking Biscayne Bay, Gym, Full Service Spa, Private Movie Theater, Resident's Lounge, Kidz Room, 24 hr Security, Concierge. This 2106 sq/ft 3BD/2.5BA is one of the most sought after lines in Marquis Residences. Enjoy stunning views of Biscayne Bay, Miami Beach, & The Atlantic Ocean from the 54th Floor of this beautifully finished unit. The unit Offers private elevator entry, stunning mix of porcelain wood and white glass flooring, zebrano Laminate and Mink Marble. Marquis Residences is located in the Heart of Miami, just steps from Museum Park, PAMM, Adrienne Arsht Performing Arts, AA Arena, South Beach, Midtown, & Brickell. Panoramic views of the Bay, Port, Beaches, Ocean and more from this 3 bedroom, 4 bath Den home with wraparound spacious balcony. A Private elevator takes you to an enclosed foyer that opens to a spacious home with views from every room. All rooms have en-suite bathrooms. Located directly in front of Museum Park and steps to American Airlines Arena and Adrienne Arsht Center. Lots of local eateries both on property and nearby. Building has two pools, spa, gym, theater and much more. Easy commute to Beaches, Brickell, Airport, Wynwood, Design district and more. Stunning 2 story townhome located in the luxurious 900 Biscayne Condominium right in the heart of the cultural center of Miami. No expense was spared in this custom designed uber chic fully furnished residence. Meticulously appointed with top of the line furnishings. There is 1 bedroom downstairs and 2 bedrooms upstairs. The master offers a luxurious bathroom and a private terrace. The sun filled 2 story living room is ideal for entertaining and opens to the large covered terrace that invites you to incredible views of Biscayne Bay and the dazzling lights of downtown Miami. Walk to museums, sporting events, concerts, shopping and world class dining. South Beach and Miami International Airport are less then 15 mins away. Bring your most discerning clients. They will not be disappointed. Luxury 3BED at Marquis; with mesmerizing 180 degree ocean, bay and city panoramic views. Private elevator opens directly into the exquisite unit. Floor-to-ceiling glass windows. Spacious flow-through residence with large glass balcony. Top of the line appliances. Located in the cultural heart of Miami. You will enjoy a full service building with sunrise lap and afternoon pool with a stunning pool deck and a World Class Spa, Gym, Dog Park, Bar, and exceptionally refined Five-Star Hotel Services. Have guests? Enjoy preferential rates at the in-house 5 star boutique hotel. It's a complete lifestyle! Beautiful water view condo in Downtown! Fully furnished, decorated by a famous interior designer. Beautiful views of the bay and the city! STUNNING BAY VIEWS FROM THIS FULLY FURNISHED BI-LEVEL CORNER TOWNHOUSE WITH LOTS OF NATURAL LIGHT AND OVER 22 FOOT HIGH CEILINGS ON THE LIVING ROOM AREA. TOP OF THE LINE APPLIANCES, WHITE GLASS PORCELAIN FLOORS THROUGHOUT, LOTS OF GLASS UPGRADES AND CUSTOM BUILT CLOSETS. GUEST BEDROOM AND MASTER BEDROOM WITH THEIR OWN PRIVATE BALCONIES. GREAT FLOOR PLAN WITH ONE BEDROOM ON THE FIRST FLOOR AND TWO MORE ON THE SECOND FLOOR, EACH ONE WITH ITS BATHROOM INSIDE. SHOWS LIKE A MODEL. Direct Ocean, bay and city views from the most desirable 01 line. Corner flow through unit with spectacular views to the East, West and South, allowing you to enjoy sunrise and sunset. Private elevator, split bedroom plan and the third bedroom is open, allowing for flexibility on how you use the space. Wide balconies accessible from the family room, master bedroom, second and third bedrooms.Open kitchen with top of the line appliances, built out closets and three and half bathrooms. 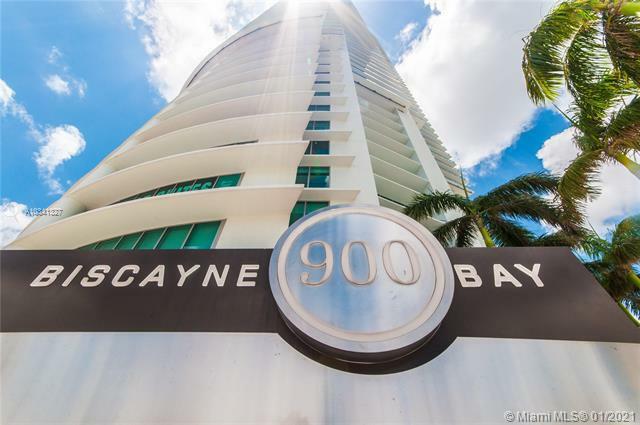 900 Biscayne Bay is luxury living at it's best with a 20,000 sqft recreation deck, newly remodeled pool area, spa, gym, theater room and residents lounge. Three story lobby, valet, concierge and front desk. Walking distance to Miami's newest attractions, The Perez Art Museum, Frost Museum and Arscht Center. Unique 4 BD / 4/1 BA Penthouse with breathtaken views! This spectacular unit offers private elevator, 4 parking spaces plus personal storage. The 1,500 Sq.Ft terrace perfect for entertaining family and friends. Building offers two pools, sauna/spa, gym, valet, kids room, movie theater and more. Everyone has a story to tell, but not everyone is able to tell it on this rare, magnificent TRI-LEVEL PENTHOUSE in renowned Ten Museum Park. Complete with it's own PRIVATE ROOFTOP equipped with a HEATED PLUNGE POOL, this magnificent 5 bedroom Penthouse in the Sky boasts open interiors with 24' ceiling heights engulfed in natural light complimented by floor-to-ceiling windows. This Penthouse dream has surrounding PANORAMIC VIEWS OF THE CITY, INTER-COASTAL, AND OCEAN. Features 5 bedrooms, 5 1/2 bathrooms, 2 TV rooms, 1 POD room w TV, 2 open kitchens, and a private rooftop heated plunge pool. Includes all utilities, credit for electric, and maid service is included.